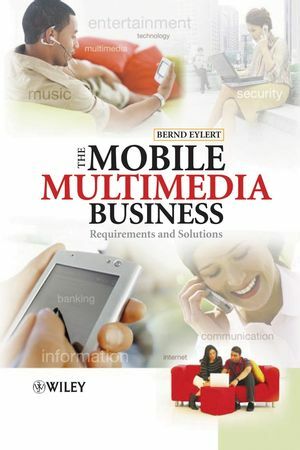 As the wireless world opens up, this book explores the evolving role of multimedia and UMTS technology in the mobile communications sector. The author draws on his extensive experience in the field to provide an approach that will appeal to academia and industry alike, covering hot topics such as regulation and licensing, services and applications, markets, security, devices and terminals and charging schemes. Numerous examples from international sources are used to illustrate the current status of the technology around the globe, examining the implications of its evolution to 4G. This is essential reading for technicians and engineers recruited to develop the UMTS and WLAN networks; employees of operators and manufacturers in the industry, new recruits to regulators, and administrators wishing to gain a background understanding of the business of mobile multimedia. Bernd F Eylert is the outgoing President of the UMTS Forum and Vice President of T-Mobile International, Bonn, Germany. He has extensive overall knowledge of the industry that is complemented by his worldwide network of contacts from academia, business and governments. He also gives university lectures on the subject and this book is based on a course that he designed for the Mobile Telecommunications course at the University of Wildau in Germany. 1.1 The 3G Mobile Pathfinders: Existing Wireless Communication Systems. 1.2 The History of 3G. 2.2 The Market Studies of the UMTS Forum. 3.2 Description of Some Services and Applications. 3.3 Portals and their Business Models. 3.4 Service Providers’ Business Strategies. 3.6 IP Multimedia Subsystem: Service Aspects. 3.7 Naming, Addressing and Other Identifiers. 4.1 The ITU IMT-2000 Family Concept. 4.5 Names and Addresses Used in GPRS. 5.2 WARC-92 Spectrum Sharing Scenarios. 5.3 More Spectrum Needed: Extension Bands for UMTS/IMT-2000 and WRC-2000 Results. 5.4 The Situation After WRC-2000. 5.5 Spectrum Beyond 3G and Preparation for WRC-07. 6. Regulation, Licensing and Global Terminal Usage. 6.4 Lessons Learned from the Licensing Process. 6.5 Global Terminal Circulation and Certification. 7. Mobile Communication and its Impact on Social Behaviour. 7.2 Theme 1: Social Connectivity. 7.3 Theme 2: Emotion and Mobiles. 7.4 Theme 3: Public and Private. 7.5 How GSM was Shaped by the Consumer. 8.1 A Long-Term Business Issue. 8.2 The Research and Development Path. 8.4 Impact on New Spectrum and WRC-2007. 8.5 Implications for System Design.